In this concluding chapter, Sumner and Hardy draw out some of the lessons from preceding chapters and synthesise the learning, particularly in relation to the key themes of involvement, impact and improvement; transformational learning; the healing power of the process; gathering the evidence of experience and co-production. They link this learning with the aspiration of Patient Voices to bring greater humanity and compassion to healthcare and set it within the context of the Patient Voices journey from stories to improvement, highlighting the centrality of stories in the healthcare endeavour. 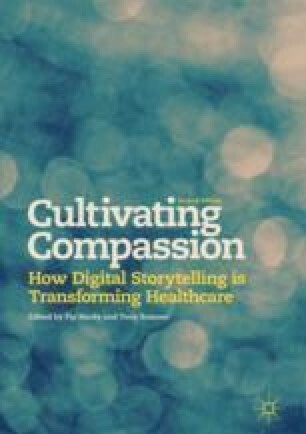 Sumner and Hardy conclude with a discussion and some examples of the ways in which digital storytelling and digital stories can—and do—contribute to greater compassion in healthcare and reiterate the potential of digital storytelling to bring about transformation. Alexandra, D. (2008). Digital storytelling as transformative practice: Critical analysis and creative expression in the representation of migration in Ireland. Journal of Media Practice, 9(2). doi:10.1386/jmpr.9.2.101/1.